Starting at 10.30am outside Jack’s Brasserie, at the bottom of Victoria Street, Alderney’s resident singing group ‘Wine and Song’ will be performing Womble songs. This will be followed by the KFA Sunbeams, who have just returned from the Milton Keynes Dance Festival, and they will be performing the World Premiere Alderney Womble Dance. There will also be a ‘Wombell’ bell ringing workshop, teaching frame and hand bells. The street procession starts at 10.45am, which will travel up Victoria Street to the exhibition venue at 39 Victoria Street (the former Bookshop) for the official opening at 11.00am by the family of Liza Robertson (Elisabeth Beresford) and a States of Alderney representative. To conclude the celebrations there will be a short and fun Wombling Quiz. The exhibition will run throughout the summer. On display will be the main Womble characters, such as Orinoco, Uncle Bulgaria and of course Alderney, as well as a selection of Womble memorabilia including bestselling books, films and soft toys, and the author’s personal collection of books. 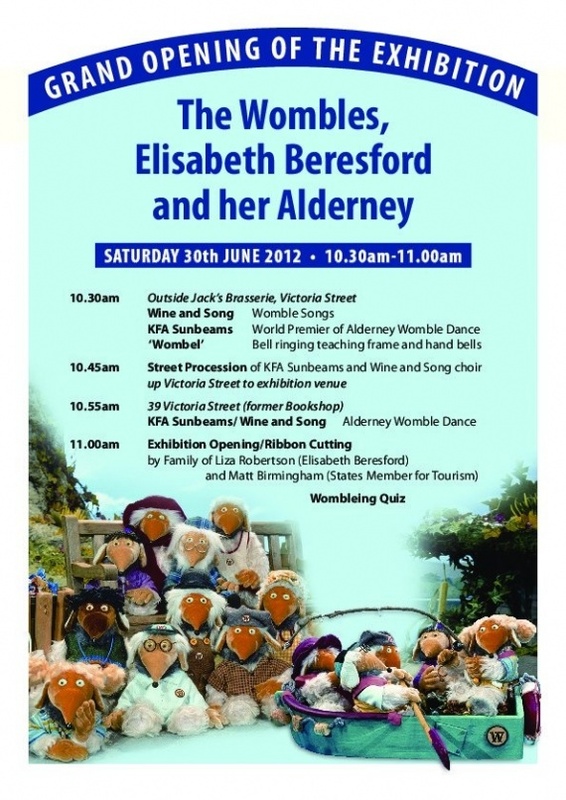 The exhibition will pay special tribute to the Wombles creator and author Elisabeth Beresford and will celebrate her many other works, her life and the special connection that she developed over a period of 50 years with the tiny Channel Island which she made her home.